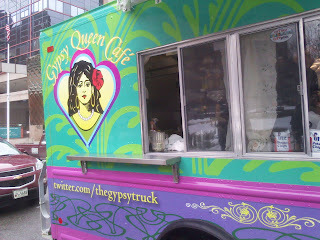 I feel so lucky that the Gypsy Queen Cafe stops by my place of work once a week. This food truck is outrageously delicious, though I shouldn't be surprised considering the owners used to own the amazing Helen's Garden in Canton (I'm still sad that it closed!). You may have heard of the truck that sells macaroni and cheese out of waffle cones - well this is it! Aren't they so creative? I love it! They also switch up a lot of their menu items, which makes it hard to get tired of them week after week! Wow were they good. 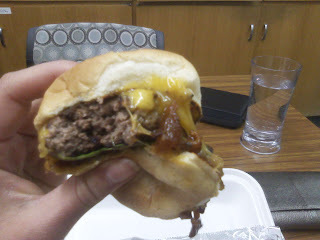 They burgers were nice and juicy and the bacon relish was sweet and caramelized and didn't overwhelm the rest of the burger, which I slightly expected. 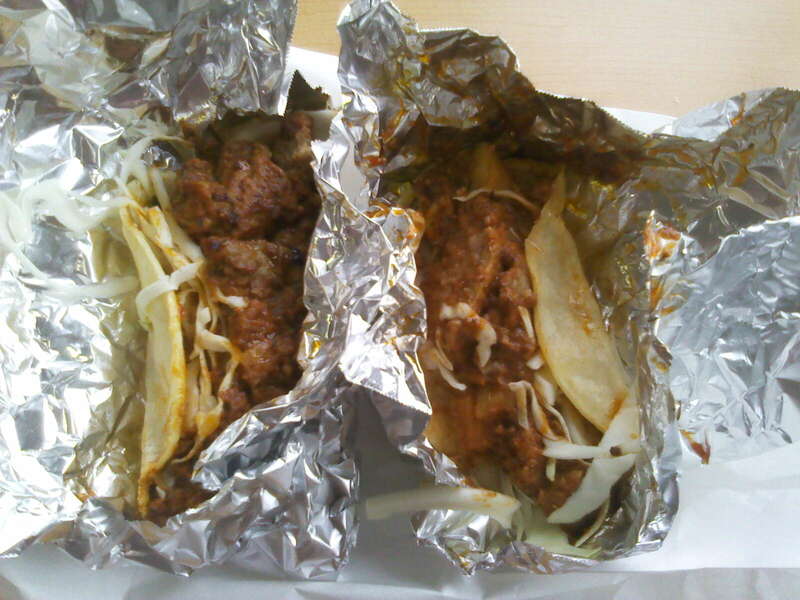 My next selection was the Chorizo and Pineapple Tacos (2 for $6). You can't tell based on the awful picture above, but I've never seen so much meat on a taco before. 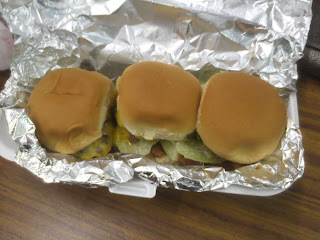 THERE WAS SO MUCH MEAT. It was incredibly hard to eat as a taco because of the WOH amount of filling and the sogginess of the tortilla, so I just ate the meat with a fork. It was still incredibly delicious and much less messier this way, though don't get me wrong, it was still a huge mess! Let's just say that I was happy I ate alone with no one watching me hahahahahah. And for $6, this was a great deal - I was full for a LOOOOONG time. My next meal will be their Crab Tacos ($10). In fact, I can't wait to try anything they want to sell me! I just love this truck! I need to remember to not pack my lunch for when the food trucks come. I feel like I am missing out. Now if only there was a craft beer truck that follows it. 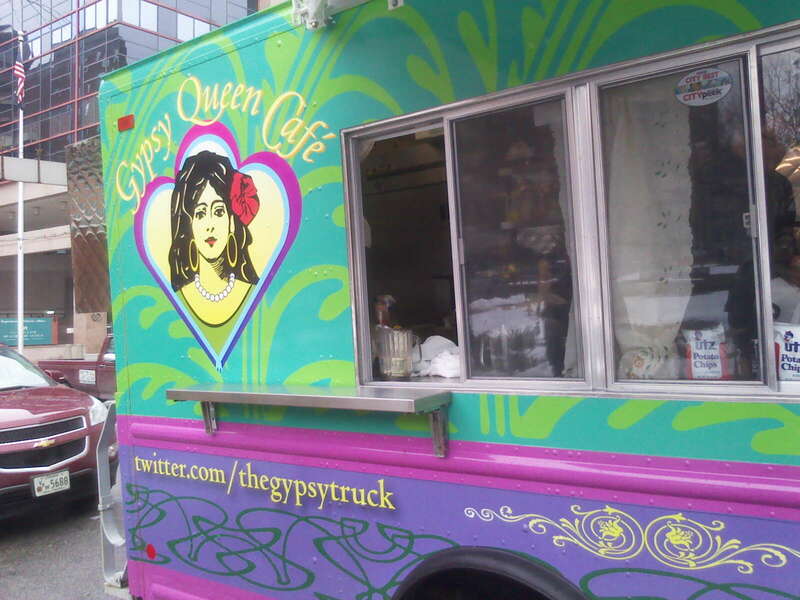 I've been getting lunch from Gypsy Queen every week. Haven't tried the crab tacos, but I have tried the Mission Bay fish taco (a bit overcooked this week, but still tasty), and the fried chicken and hush puppies with maple syrup was delish. HUGE serving though...far too much food for one person. Kathy - That fried chicken meal sounds AMAZING! my boyfriend is a fan of this truck, every Thursday he snaps a shot of the menu to post on FB. i am incredibly jealous. i told him to get the fried chicken today. Looks tasty! And you have got to love that kind of convenience, no? With its mobility, it can strike when the iron's hot, stopping outside your workplace bringing along the delicious goods.